This year has been all change at the top of the Space Data Association (SDA). Although I had already been heavily involved as one of the Executive Directors, I took over the Chairmanship at the start of 2015. This was quite a daunting task, following Ronald Busch who had held the position for the previous two years and was always going to be a hard act to follow. In actual fact, this is hard to believe that this change of roles only occurred at the beginning of this year, as a lot seems to have happened since then. I was instantly in at the deep end with the lead up to our annual members meeting in Washington in conjunction with the Satellite show. This SDA event ran smoothly and our working groups did an excellent job of providing updates of their valuable work over the previous year. Interference mitigation remains an important topic for the SDA this year. The Carrier ID database forms a huge part of our remit. The prototype was ready for the football World Cup last year and the organization was pleased to have been able to support CID transmissions on broadcast carriers during this mammoth sporting event. This year, we have been working on some further refinement of the CID database, which is available to all satellite operators, not just SDA members. This is truly important, as we need widespread implementation for Carrier ID to be truly effective. The other big push for us in relation to combating interference has been to support geolocation development activities. Earlier in the year, the organization talked about a new function being developed in the Space Data Center for the automatic computation of geolocation solution sets. Work continues on implementing this new feature into the SDC. The concept behind this feature is based on a description of the RFI event. The SDC will analyze critical payload data for the both the victim and adjacent satellites. This will enable the system to compute optimum satellite pairings for geolocation and generate a set of data that can be downloaded into a member’s geolocation system, including accurate ephemeris data for the two satellites. A new geolocation support service is also being planned. Many satellite operators do not have the means to perform geolocation when interference occurs and that inability can be a huge problem for them. The SDA will, therefore, shortly be offering geolocation as a service to our members who do not possess their own systems. This move is being supported mainly by the Executive Members and should really make a difference in helping our members resolve interference quickly and efficiently. Flight Dynamics and reducing the risk of collision is another important topic. In May, the SDA presented a paper at the Centre National D’Etudes Spatiales (CNES) international workshop on Conjunction Assessment, looking at what the industry needs to do to improve CA. Directly after that event, Eutelsat hosted a Flight Dynamics meeting for the SDA, chaired by our working group lead, Erika Rossetto of StarOne. Leading experts discussed a number of important topics that included handling leap seconds, integrating third party data and desired enhancements to the Space Data Center. The result was a number of important recommendations that are now being developed for incorporation into the Space Data Center. Another working group focuses on new products, which can help satellite operators improve the space environment. In order to do that effectively, as much input as possible is needed to be collected to assist the organization in understanding the challenges faced by a wide cross-section of the industry. Earlier this year, John Mackey of Inmarsat, who heads up the Product Evolution Working Group, issued a call for participation for this group. The group has already contributed some useful comment, new perspectives, and suggestions, and I look forward to seeing what comes from further discussions throughout 2016. Everything the SDA works on is made better and easier the more input and data received. Therefore, a great deal of emphasis has been placed into growing the membership. So far this year, a total of four new members have joined the SDA, with more expected to join before the end of the year. New members include Telenor Satellite Broadcasting, ORBCOMM, TÜRKSAT, and, most recently, the German Aerospace Center (Deutsche Zentrum für Luft- und Raumfahrt; DLR). 2016 promises to be another action-packed year for the Space Data Association. The organization intends to expand the membership, which will result in a more comprehensive, global representation and the plan is to expand the organization’s capabilities to better serve those members, with a number of new developments in the pipeline. We are in the midst of a new space renaissance that is surprising and inspiring. As a kid who grew up around the aerospace industry and even attended NASA space camp, the fascination has been to see the old space model—centered on human spaceflight— replaced with a new model focused on small satellites and big data. This new model allows for innovation to occur outside of the traditional space hubs of Houston and Florida, in communities with access to capital and software and big data talent, as witnessed in cities such as Seattle and San Francisco. Instead of an industry driven exclusively by government-focused programs, the new space model is driven by commercial companies with a desire for services that make space access possible. The expansion of the smallsat industry indicates how far we’ve come from a space program centered on big infrastructure and human spaceflight. This new opportunity to work with commercial entities and help democratize access to space initiated the launch of Spaceflight in 2010. The focus was to develop programs and services that met the needs of customers and ensured them they got where they needed to go. Over the past five years, the company has steadily grown the operation, creating new opportunities for smallsat ride share launches, including the purchase of our own SpaceX Falcon 9 this fall to satisfy the growing needs in the marketplace. During 2015, Spaceflight achieved many goals in an effort to set a new standard for what is possible in the industry and to enable access to space for more organizations. However, this same success has also presented the challenge of growth as the business is scaled to respond to customer needs. As a pioneer in the emerging space market, several of the obstacles encountered are a direct result of keeping up with our own innovation, which is something all are proud of accomplishing. Spaceflight’s success is due in part to location—based in Seattle, the company benefits from a deep bench of software and big data talent that helps to drive innovation. We are also fortunate in the number of investors who understand the tremendous opportunity in the exploration and commercialization of space within the smallsat industry. Significant funding was secured this year, allowing the employee base and infrastructure to grow in order to deliver experiences that exceed customer expectation. Top talent from the local tech industry and from around the country have been attracted—from NASA, the U.S. Department of Defense and SpaceX—all who want to be on the forefront of lowering the barriers to space. To say you’ve purchased a rocket is definitely not an everyday occurrence—however, in September, Spaceflight did just that, purchasing a SpaceX Falcon 9 rocket and then expanding launch services to include dedicated rideshare missions, a new launch alternative that blends cost-effective rideshare pricing with first-class service that is typically associated with buying a private rocket. Our dedicated rideshare missions will deliver customer spacecraft to popular destinations, such as sun-synchronous and geosynchronous transfer orbits, starting in the second half of 2017 with our the mission, named the “2017 Sun Synch Express.” We envision creating steady access to space with yearly dedicated rideshare missions beginning in 2017. Purchasing entire rockets and using them strictly for rideshare allows Spaceflight to control the launch schedule as well as the ability offer access to useful orbits for smallsat operators that cannot afford a complete launch vehicle. This also advances our mission to provide customer-focused, full-service launch experiences. Speaking of the 2017 Sun Synch Express mission, the company was the first to announce involvement with the first Israeli mission to the moon and the world’s first private lunar mission. By signing on as a co-lead payload on our inaugural dedicated rideshare mission, Israeli-based SpaceIL became the first Google Lunar XPRIZE team to produce a verified launch contract, which may well lead to a $20 million prize if their mission is a success. We’re excited to manifest SpaceIL’s spacecraft, which will sit in a designated capsule inside the Falcon 9, among a cluster of secondary payloads. Once the capsule separates from the launcher, it will automatically release the spacecraft, which will use advanced navigation sensors to guide it to the lunar surface, with engineers in a mission control room standing by to remotely send commands and corrections as needed. Additionally, three ground stations were brought online in 2015. Previously, ground infrastructure business catered to larger satellite operators with customized ground stations. The challenge was to build the next generation of ground infrastructure that are specifically targeted at the smallsat boom. Other projects include: a partnership with satellite data company Spire Global, Inc. to market and offer ground communication services using their global network of UHF and S-band stations; relationships with spacecraft radio providers Tethers Unlimited, BitBeam Inc. and Syrlinks to expand customer options; a partnership with RT Logic to simplify and assure ground-to-space communication requirements for smallsat operators so they are able to focus more completely on mission and payload issues; and BlackSky, a “satellite imaging as a service,” to enable near-real time monitoring of Earth. Spaceflight is well-positioned to drive the smallsat revolution. No longer will organizations need their own rocket. Spaceflight will continue to innovate and invest in programs to foster a new era where space access is a finely-tuned service of enormous benefit to those involved in the smallsat industry. SpeedCast embarked on a journey of global expansion in 2012 and, three years on, the company continues to change the way customers communicate globally. 2015 saw SpeedCast expand its horizons to become a truly global player as the firm continues to be the major market consolidator. The company substantially grew during 2015 and now has approximately 400 employees throughout 29 offices around the world, and also experienced growth in operational infrastructure, geographic reach and a solid increase in customer number and diversity. In 2015, SpeedCast provided vital communications solutions to more vessels and terrestrial sites than ever before, with the maritime market continuing to experience growth during the year. Gearbulk, a specialist in high quality shipping services, awarded SpeedCast a multi-year communications contract for mission-critical and social communications on 50 cargo vessels across the world. SpeedCast was also selected by Vroon to provide a Ku-band satellite service to facilitate high-performance broadband connectivity with multi-megabit speeds and a “hotel-like” user experience for clients aboard three of that company’s vital accommodation vessels. The company was awarded one of our largest-ever satellite service agreements in the energy market segment—a landmark deal. The company was selected by one of the most prestigious global oil and gas service companies to provide satellite services in more than 20 countries for onshore and offshore sites in Asia Pacific and Africa. ConocoPhillips selected SpeedCast in a multi-year, multi-million dollar contract to significantly increase the primary satellite communications services provided to the ConocoPhillips operated asset located in the Bayu-Undan field in the Timor Sea. An additional agreement for the company is to provide InterOil Corporation with a range of field connectivity solutions to their 12 locations, including base camps, construction sites and remote rig sites located in the Gulf Province of Papua New Guinea. 2015 has also been a productive year for SpeedCast’s Enterprise and Emerging Markets business. Significant growth in the GSM market has been realized. SpeedCast continues to provide innovative cellular backhaul solutions for GSM operators that reach further into remote rural areas and also increases capacity in suburban or semi-rural areas. A major deal for SpeedCast in this sector was to supply a significant part of mobile operator’s backbone in Myanmar as they roll out 3G services in that country. In the broader Telecoms vertical, SpeedCast has experienced a string of successes supplying satellite services to major ISP’s and telco’s in the Pacific. There were positive developments in the NGO and Media verticals that have contributed to SpeedCast’s success in 2015. In Myanmar, the company established a new legal entity in anticipation of new office opening in 2016. Geolink Satellite Services—SpeedCast significantly enhanced its capabilities to serve and support its customers in the African market and in providing services to the maritime sector. Hermes Datacomms—This acquisition opened up capabilities in an additional 54 countries that represent 92 percent of the world’s oil & gas reserves and an extensive portfolio of blue chip energy customers. NewSat Satellite + Teleport Services—Augmented SpeedCast’s already well-established Australian network with NewSat’s infrastructure assets and customer base. SAIT Communications—Expansion of SpeedCast’s maritime business through SAIT’s long term customer relationships with large Greek shipping companies, a strong L-band expertise, and an innovative portfolio of value-added services. ST Teleport—Further strengthens the company’s position in the maritime and energy sectors in Asia-Pacific. In July, the company acquired two prime teleport facilities in Perth and Adelaide, both recognized as highly secure Global Access Points and support certified classified networks for the transmission of vital and sensitive information for military and government clients. Also, through the acquisitions of Hermes Datacomms and ST Teleport, SpeedCast now owns three more teleports in the United Kingdom, Kazakhstan, and Singapore. SpeedCast also complemented its traditional geostationary satellite (GEO) based services by providing satellite services via O3b’s innovative Medium Earth Orbit (MEO) satellite constellation. Remote communities and enterprise customers now enjoy latency as low as 150 milliseconds, increased Internet speeds and improved voice and video quality. At the half-year mark, SpeedCast revenues grew by 23 percent versus the previous year, while the maritime business grew 38 percent, well above the market average growth rate. The profitability of the business also continued to improve with EBITDA growing at a faster pace than revenue. Furthermore the significant wins achieved in the second half of the year will underpin delivery of organic growth in 2015/2016. 2015 has truly been a transformational year for SpeedCast across all aspects of our business, from the firm’s operational infrastructure, to the geographical reach as well as to the number and diversity of our customers. The foundation of this growth and success has been the company’s unwavering commitment to delivering fast and reliable communications that exceed customers’ expectations. SpeedCast looks forward to continued growth in 2016, as we renew our commitment to driving operational excellence for our customers, wherever they are. As the year draws to an end, we will close another section of STN’s history to date, and, like a good book, some elements have been more exciting than others. 2015 has certainly been extremely interesting for STN and I am pleased to say that this particular chapter ended on a highly positive note as a result of the firm’s steady growth and development. STN is now a trusted partner to more than 600 TV channels, providing media service solutions on a global scale, with access to all prime orbital positioned satellites and major POP’s around the world. Similar to all good, best sellers, there is an introduction, a main body and an end—but the peak of this story has not yet been reached and there are many more twists and turns yet to be unveiled. At the start of the year, the STN logo was rebranded and an internal restructure occurred, with new management throughout the company. This resulted in enhanced client relations and optimized services. There is a new burst of revitalization within STN and a growing interest as where this new and planned direction will lead. In the Industry this year, many new satellites were launched and, although this section of the industry is still very remunerative, close attention must be paid to the increasing presence of all IP based content delivery. OTT services are becoming the norm and what once seemed a to be but a distant requirement is quickly becoming an everyday necessity. Technologies are continuously upgrading and prudent investment is now more important than ever before. “One must always endeavour to stay a few paces ahead but never so far that you lose sight of the very essence of your business.” With all this in mind, STN acquired additional transponders on the newly launched and powerful anti- jamming Eutelsat 8WB satellite and signed a new capacity agreement on SES’s popular Astra 19.2 degrees East satellite. STN also introduced Yahsat-1A at 52.52 degrees East to customers by consolidating all of the service requirements for one client with 27 channels (17 SD and 10 HD), making this client’s HD channels the largest offering from a single provider in the region. As a result of STN’s continuous research into the latest available technologies, one of this years completed investments was the installation of the new Elemental head-end equipment. This ensures STN can support all of the major CDN networks and major network protocols, such as HTTP or RTMP, and streaming delivery architectures and Apple HLS or Microsoft Smooth Streaming. Having already performed various tests with High Efficiency Video Coding (HEVC) compression, in SD and HD resolutions, we can affirm the fact that the potential of HEVC is enormous in scope—HEVC encoders are already proving their value. STN continued to modernize and invested in a major Internet and L2 PoP’s infrastructure upgrade, which incorporated investment into the new ASR 1000 Series Aggregation Services Routers, Cisco ASA 5585-X models with FirePOWER Services, and a Security Services Processor (SSP) for maximum protection against any potential threats on the Internet lines. Simultaneously, the company has increased all international traffic capabilities on various PoP’s around the world. The new IP based infrastructure will provide the STN with extremely flexible and robust solutions, while retaining the maximum possible quality for SD/HD/UHD formats as well as for MPEG-2/MPEG-4 AVC/HEVC video codecs. The new IP based infrastructure meets the latest technological standard and is also enabling STN to offer customers even higher reliability and flexibility, all at highly competitive pricing due to the fact that the costly Routing and Switching equipment will be completely eliminated. With the current demand for new channels and planned satellite launches, the satellite industry will continue to be prominent for the coming future. However, there are uncertainties as to how quickly the balance may sway toward more cost effective, IP-based distributors. Let’s keep in mind that, for now, regions such as Africa, the Middle East, South America, and a large area of Asia remain traditional TV users —our belief is that this will remain true for the foreseeable future. Another topic to mention that seems to be on everyone’s mind is that the industry has been promoting UHDTV —the nexgen TV experience—heavily over the last two years. But, we must ask ourselves, first and foremost, are the consumers ready to embrace this new piece of technology? Especially if we take into consideration the debacle of 3D and the announcement of the 8k television experience. Obviously there are corporate interests pushing UHDTV forward. Realize, that in today’s world where every consumer is bombarded with so many gadgets, it is hard (if not impossible) simply to keep up with what is going on in broadcasting technology. Every penny is turned twice of thrice before being spent, and UHDTV may not be the first line of choice when it comes down to consumer purchases; especially due to the scarcity of proper 4k content. For STN, I am pleased to confirm that the company is continuing its current trend of annual growth. Project plans are already underway for the development of an additional 10,000 m² of land, which will include an extended dish farm and new equipment housing. 2016 will see new structural developments for the company as well as additional and notable advancements occurring within the changing face of STN. And so, a new chapter begins…. 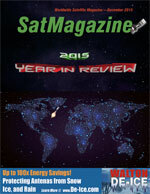 Simply amazing—a year has passed since I last authored a Teledyne Paradise Datacom’s Year-in-Review feature article. It just doesn’t seem that long ago that I was sitting in this same chair and gazing out of the same window, as I took my retrospective jaunt through the trials and tribulations of 2014—being so ready with the hopes of a bountiful new year. And yet, here I sit once again in the cabin of my intellective time machine watching as a new set of images streams past—images wrought with what are now the trials and tribulations of 2015. “Out with the old and in with the new” was a bit less spectacular than some had predicted. Right on the heels of last year’s cruel gifts—government sequestration, a turbulent global economy and growing pockets of civil unrest in Europe, South America and the Middle East, we were met with a new volley of hot potatoes—a scandal in Brazil, Russian trade restrictions, more violent clashes in the Middle East and a nosedive in the price of oil. Though the latter was great for us recreational pilots and drivers of enormously inefficient SUVs, it was devastating to many of the countries that rely on oil revenues to fuel their fiscal budgets. You can add to that the rise in the strength of the US dollar against already stressed foreign currencies—not great if you’re selling products into economies plagued with diminished buying power—economies whose growth is vital to the health and wellbeing of the satcom industry as a whole. However, despite the invasive bramble of fiscal attrition that has taken root in the once fertile fields of our industry, pockets of opportunity do still exist. At least, they exist for those manufacturers who have judiciously crafted their products to best serve those markets that have retained some semblance of critical mass. And, since some of these markets, or applications, reside on the fringes of ‘mainstream SATCOM’, Teledyne Paradise Datacom has tooled and staffed all operations with the necessary assets to address not only the garden variety of conventional frequencies and bandwidths, but also the most non-conventional and complex requirements that come our way. Much of the business these days is in the production of SSPAs that operate in the L & S-bands for LEO, Troposcatter and TT&C, low X-band for Deep Space Exploration and high-power Ka-band for airborne platforms and HTS gateways. Though we’ve invested heavily in GaN technology, we’re still developing and promoting GaAs amplifiers for applications where Gallium Nitride falls short. The new high-power Ka-band SSPA has just started shipping, after producing what the company believes is the highest-power solid state module available today and what will inevitably become the foundation for the firm’s 200 and 400 watt Ka-band amplifiers early next year. This new line will carry us well into TWTA territory, but with the reliability and longevity customers have come to expect from solid state products. The design team on the modem side has been equally hard at work incorporating the latest features and capabilities into the company’s ‘Q’ line. Q-Flex, the most versatile SCPC modem in the market, Q-Lite—our equally powerful, half-sized variant for SOTM applications—and Q-MultiFlex now offer the benefits of high symbol rates, DVB-S2X and a long list of Paradise-proprietary features that insure customers are getting the best return on their transponder lease payments. During the last couple of years, TPD evolved beyond producing point-to-point SCPC modems by developing a powerful and simple-to-implement satellite network platform that we call ‘Q-NET.’ The Q-MultiFlex multi-demod modem was the missing link needed to create very low-cost architectures for STAR and Mesh networks in applications that require a level of link efficiency and data-throughput that transcend what can be accomplished with most VSAT systems. Having Q-MultiFlex, with its single modulator and up to 16 discreet demodulators, has tipped the scale of affordability in Teledyne Paradise Datacom’s favor—by a wide margin. The principal Q-NET building blocks include the Q-series of modems, the ‘Navigator’ M&C and ‘Bandwidth Manager’ for the ultimate in network flexibility and control. With Q-NET Bandwidth Manager, operators can drag and resize RF carriers with a mouse to instantly reconfigure bandwidth usage on the fly. Q-NET Bandwidth Manager has a powerful set of statistical graph and report features to assist operators in fine tuning their networks for optimum payback. A constant readout of transponder resources and carrier-proximity alarms prevent operators from accidentally exceeding capacity. In the event that a link is lost due to misconfiguration, a Reversionary Control feature will return the link to you after the fact, without having to visit the remote station. As I said this time last year, the company will soon be closing the books on another year in a market of flaccid disquietude and setting our collective minds on what we think, hope and fear will transpire in 2016. If nothing else, the last few years have shown us that the SATCOM crystal ball is covered with mud. Initiatives are already in play that will inevitably impact this industry in a most profound way. O3b, Global-Xpress, OneWeb and a variety of HTS platforms will force manufacturers to tweak portfolios and help drive Internet access to the 60 percent of the world that still lacks such connectivity. After all, the boundless nature of SATCOM has allowed the influences of modern society to touch the lives of even the most primitive cultures, enlightening them to the fact that watching streaming video and surfing the web is much better than doing anything that requires effort. The Paradise Datacom roadmap is aligned with the market trends that manifest the greatest signs of vitality. The focus is on efficient, high-power SSPAs that operate at virtually every slice of the frequency spectrum and low-cost network solutions that are easy to install and operate. Soon, the company will be announcing incorporation of the latest in 3G/4G optimization technology that will even further enhance our portfolio of modem products. 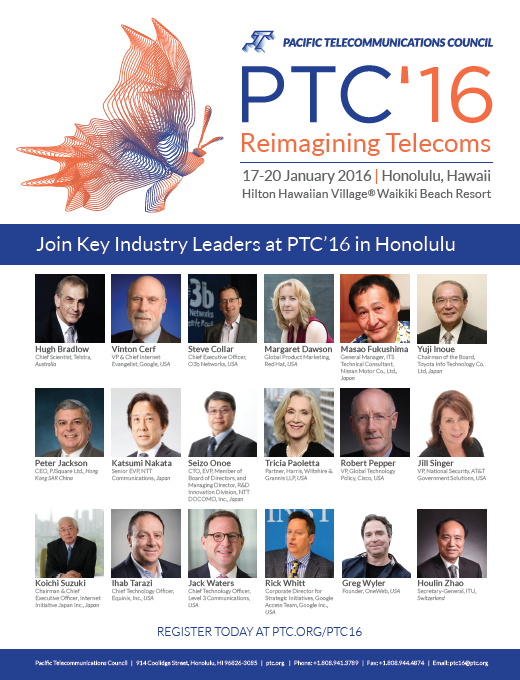 Is 2016 going to be a banner year for SATCOM? Impossible to say at this point. Hopefully, we’re running out of hot potatoes.